Hello again. My second thread will be about NPC double attack and dual wield chance. Parsing logs is sort of my thing. Scripts to count up resists aren't the only parsers I wrote. In my efforts to assist Project EQ/TAKP, I wrote parsers specifically for the purpose of determining NPC attack delays and round sizes. If an NPC can dual wield, and you give it two weapons, then its model will visibly update with the weapons in hand. I gave level 1 and level 3 mobs two weapons and they did not wield the second one, but a level 4 mob did use both and was attacking for both damage types. NPCs as low as level 4 can double attack, possibly lower. NPCs gain the ability to dual wield at level 4. NPCs do not double attack with their off-hand until level 36. Double attack rates (after 35) for the main-hand and off-hand are the same. NPC double attack rates are roughly 1% per level up to level 35. NPC off-hand attack rates are roughly 1.3% * level up to level 35. 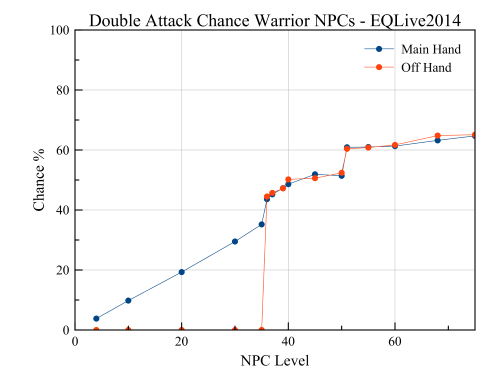 NPC double attack rates and off-hand attack rates increase significantly at levels 36 and 51. Caster NPCs double attack and dual wield, and at the same rates Warrior NPCs do. If the NPC can wield weapons and has two 1handers in its possession, it will dual wield them (from level 4 onwards) giving them a chance to swing the off-hand. The off-hand cannot double attack until level 36, at which point NPCs have the ability to quad attack when wielding weapons, which requires the NPC to successfully roll a dual wield and two double attacks. The chances of successful rolls increases with level. The off-hand has its own attack delay; the attacks from both hands will not pair up every round unless both weapons have the same attack delay. Every NPC has a weaponless attack delay. The NPC will attack at the faster of the two rates if it is wielding a weapon. Raid boss attack delays are so fast that they will almost always end up using the weaponless attack delay, which is why they quad in logs even when wielding two weapons with different delays. Not all NPCs can wield weapons. These NPCs can spawn with weapons or be given them while charmed and they will refuse to wield them, meaning they will never quad attack no matter what. (assuming it is not innate dual wield flagged) Examples include animal NPCs in PoP (poor druids); giants in BoT; and robe, cavemen, and alien NPCs in Maiden's Eye. I've not been looking for this so I don't have a long list, but it seems common in PoP. I don't know of any examples before Luclin; giving animal pets weapons in earlier eras on my druid seemed to work fine until PoP. Maybe it's a Luclin addition? If the NPC has has a 2H weapon, then the NPC will only double even if it would quad without a weapons. If the NPC has two 1H weapons, then the NPC will wield both and output the damage types of both weapons as normal. Innate quad is basically just dual wield forcibly enabled even without weapons or with just one weapon. If a NPC does not have this innate quad/dual wield feature enabled, then it will always double attack unless it is wielding two 1H weapons. This flag was generally only enabled on raid bosses, and not every boss had it-- The Statue of Rallos Zek for example did not quad unless it spawned with two weapons. I've only found a few 'trash' mobs that had it, like the level 68 doomfire NPCs in PoFire. Currently EQ Emulator has three flags related to round sizes: Triple Attack, Quad Attack, and Dual Wield. However enabling Dual Wield for an NPC on EQEmu makes it quad even without weapons. This is either an oversight or a design choice that doesn't match with EQLive. (seems redundant to design it to function like Quad Attack though) On EQLive, dual wield is seemingly enabled for every NPC in the game starting at level 4. (admittedly my sample size isn't huge enough to prove this 100% but I think it likely) So a more accurate functionality would be to hard-code the enabling of dual wield on all NPCs level 4 and above, then replace the Dual Wield flag with a 'Can't Wield' flag. (or a 'Wields Weapons' flag, but this would end up being checked on the vasty majority of NPCs) For more accuracy, Quad Attack should be replaced with 'Innate Dual Wield' which enables off-hand attacks without an off-hand weapon instead of 4 attacks from the main-hand. [Wed Apr 02 16:13:20 2014] Sevalak tries to slash YOU, but misses! [Wed Apr 02 16:13:20 2014] Sevalak tries to slash YOU, but YOU block! [Wed Apr 02 16:13:20 2014] Sevalak tries to claw YOU, but YOU dodge! [Wed Apr 02 16:13:20 2014] Sevalak tries to claw YOU, but misses! [Thu Apr 10 02:33:57 2014] Lord Koi`Doken tries to pierce YOU, but YOU block! [Thu Apr 10 02:33:57 2014] Lord Koi`Doken tries to pierce YOU, but misses! [Thu Apr 10 02:33:57 2014] Lord Koi`Doken tries to hit YOU, but misses! weapon. Another parse, without him piercing, has him quadding. MySEQ showed him wielding a 'flamberge', and he was procing the weapon's proc. This NPC is a Monk. I will explain the triple round below. [Sun Nov 17 02:12:41 2013] Lord Kreizenn slashes YOU for 950 points of damage. [Sun Nov 17 02:12:41 2013] Lord Kreizenn slashes YOU for 287 points of damage. [Sun Nov 17 02:12:43 2013] Lord Kreizenn slashes YOU for 209 points of damage. [Sun Nov 17 02:15:42 2013] Lord Kreizenn slashes YOU for 209 points of damage. [Sun Nov 17 02:15:42 2013] Lord Kreizenn tries to slash YOU, but misses! [Sun Nov 17 02:15:45 2013] Lord Kreizenn slashes YOU for 716 points of damage. [Sun Nov 17 02:18:36 2013] Lord Kreizenn tries to slash YOU, but misses! [Sun Nov 17 02:18:38 2013] Lord Kreizenn tries to slash YOU, but misses! [Sun Nov 17 02:18:39 2013] Lord Kreizenn slashes YOU for 365 points of damage. [Sun Nov 17 02:18:39 2013] Lord Kreizenn slashes YOU for 911 points of damage. [Sun Nov 17 02:18:42 2013] Lord Kreizenn tries to slash YOU, but YOU dodge! [Sun Nov 17 02:18:42 2013] Lord Kreizenn slashes YOU for 404 points of damage. [Sun Nov 17 02:18:43 2013] Lord Kreizenn tries to slash YOU, but YOU dodge! When EverQuest was younger, Warriors and Monks got a hidden innate triple attack at level 60 that was not something that raised up like regular skills. My parses of Al'Kabor and EQ circa 2003 also have every level 60+ Warrior and Monk NPC triple attacking-- it wasn't just given to player characters. I don't know if other classes (like rangers) got it; I think some other classes might have gotten it at a later time. 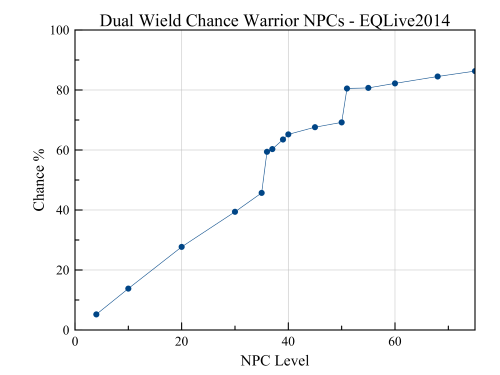 In modern EQ, level 60+ NPCs no longer triple. I assume NPCs lost triple attack once SOE made triple attack an 'official' skill rather than a small innate chance. I know of no NPCs on EQLive that triple but not quad. (with the exception of sub level 36 mobs that cannot double attack the off-hand) Note that rogue NPCs that backstab the front of a target will display as a normal hit instead of a backstab, which can make the round look like it has one more swing in the log. As far as I know, triple attack had a small chance to occur on a successful double attack. My parses suggest a 10% chance to occur on a successful double attack round, but this has a wide margin of error. My data collecting efforts began only after the Al'Kabor shutdown notice and my time was spent collecting NPC min hit, max hit, and max hp data, so I wasn't thinking about this kind of data at the time, otherwise I'd have produced an overnight log or two. Since level 60+ Warrior and Monk NPCs in old EQ could triple atack, this lead to the somewhat rare possibility of the mob attacking five times in a single combat round. This required the NPC to successfully roll dual wield, double attack twice, and triple attack all in the same round, so it was uncommon. [Thu Nov 07 20:10:01 2013] Tranala bashes YOU for 67 points of damage. [Thu Nov 07 20:10:03 2013] Tranala hits YOU for 181 points of damage. [Thu Nov 07 20:10:03 2013] Tranala hits YOU for 226 points of damage. [Thu Nov 07 20:10:03 2013] Tranala tries to hit YOU, but misses! [Thu Nov 07 20:10:03 2013] Tranala hits YOU for 118 points of damage. [Thu Nov 07 20:10:03 2013] You are unstunned. [Thu Nov 07 20:10:05 2013] Tranala tries to hit YOU, but misses! [Thu Nov 07 20:21:10 2013] Travala tries to hit YOU, but misses! [Thu Nov 07 20:21:10 2013] You begin casting Light of Nife. [Thu Nov 07 20:21:11 2013] You have been healed for 850 points of damage. [Thu Nov 07 20:21:11 2013] You are bathed in the light of life. [Thu Nov 07 20:21:11 2013] Travala hits YOU for 181 points of damage. [Thu Nov 07 20:21:11 2013] Travala hits YOU for 64 points of damage. [Thu Nov 07 20:21:11 2013] Travala hits YOU for 199 points of damage. [Thu Nov 07 20:21:11 2013] Travala tries to hit YOU, but misses! [Thu Nov 07 20:21:13 2013] Travala hits YOU for 109 points of damage. [Thu Nov 07 21:32:27 2013] Tantor tries to gore YOU, but misses! [Thu Nov 07 21:32:29 2013] You slash Tantor for 124 points of damage. [Thu Nov 07 21:32:29 2013] You try to slash Tantor, but miss! [Thu Nov 07 21:32:29 2013] Torvie begins to cast a spell. [Thu Nov 07 21:32:29 2013] Tantor tries to gore YOU, but misses! [Thu Nov 07 21:32:29 2013] Tantor tries to gore YOU, but YOU parry! [Thu Nov 07 21:32:30 2013] Tantor glances nervously about. [Thu Nov 07 21:32:30 2013] You slash Tantor for 160 points of damage. [Thu Nov 07 21:32:30 2013] You try to slash Tantor, but miss! [Thu Nov 07 21:32:31 2013] Tantor tries to gore YOU, but misses! [Thu Nov 07 23:16:39 2013] Sontalak begins to cast a spell. [Thu Nov 07 23:16:39 2013] Sontalak has been dispelled. [Thu Nov 07 23:16:41 2013] Sontalak tries to bash YOU, but misses! [Thu Nov 07 23:16:41 2013] Sontalak claws YOU for 215 points of damage. [Thu Nov 07 23:16:41 2013] Sontalak tries to claw YOU, but misses! [Thu Nov 07 23:16:41 2013] Sontalak tries to claw YOU, but YOU parry! [Thu Nov 07 23:16:41 2013] Sontalak claws YOU for 350 points of damage. [Thu Nov 07 23:16:41 2013] Sontalak claws YOU for 305 points of damage. [Thu Nov 07 23:16:43 2013] Sontalak tries to claw YOU, but misses! [Fri Nov 08 23:27:52 2013] Supernal elixir pumps through your body. [Fri Nov 08 23:27:57 2013] Auto attack is on. [Fri Nov 08 23:27:57 2013] You try to slash Telkorenar, but miss! [Fri Nov 08 23:27:57 2013] Telkorenar tries to claw YOU, but misses! [Fri Nov 08 23:27:57 2013] Telkorenar claws YOU for 240 points of damage. [Fri Nov 08 23:27:57 2013] Telkorenar tries to claw YOU, but YOU parry! [Fri Nov 08 23:27:57 2013] Telkorenar claws YOU for 195 points of damage. [Fri Nov 08 23:27:57 2013] Auto attack is off. [Fri Nov 08 23:27:58 2013] Your eyes stop tingling. [Fri Nov 08 23:27:58 2013] Your body combusts as the lava hits you. You have taken 125 points of damage. [Fri Nov 08 23:28:00 2013] Telkorenar claws YOU for 480 points of damage. That round from Telk was his first round, which makes it very unlikely to be a 'double round'. [Fri Nov 15 23:25:35 2013] Jekn slashes Nevor Jikman for 58 points of damage. [Fri Nov 15 23:25:36 2013] Nevor Jikman was hit by non-melee for 64 points of damage. [Fri Nov 15 23:25:36 2013] Nevor Jikman was pierced by thorns. [Fri Nov 15 23:25:36 2013] Nevor Jikman hits YOU for 193 points of damage. [Fri Nov 15 23:25:36 2013] Nevor Jikman tries to hit YOU, but misses! [Fri Nov 15 23:25:36 2013] Nevor Jikman hits YOU for 667 points of damage. [Fri Nov 15 23:25:36 2013] Torvia slashes Nevor Jikman for 52 points of damage. [Fri Nov 15 23:25:36 2013] Torvia slashes Nevor Jikman for 72 points of damage. [Fri Nov 15 23:25:37 2013] Torria begins to cast a spell. Nevor was fully 70% slowed in that log. I couldn't tell you if triple attack was possible in the off-hand, enabling six attack rounds. If it was possible, it would have been extremely rare.